Once we finished up at Badlands National Park, we headed to Mount Rushmore and then to the Grand Tetons. I obsessively played the song “As We Ran” by the National Parks until Frank nearly threw my phone out the window. Needless to say, I personally believe the Grand Tetons are the best national park. When we got close, we stopped outside of the park at a rest area to fill our empty water jugs. On this trip, we carried nearly 20 empty cranberry juice jugs. This way, we didn’t need to carry a water filter or pay for water from stores. 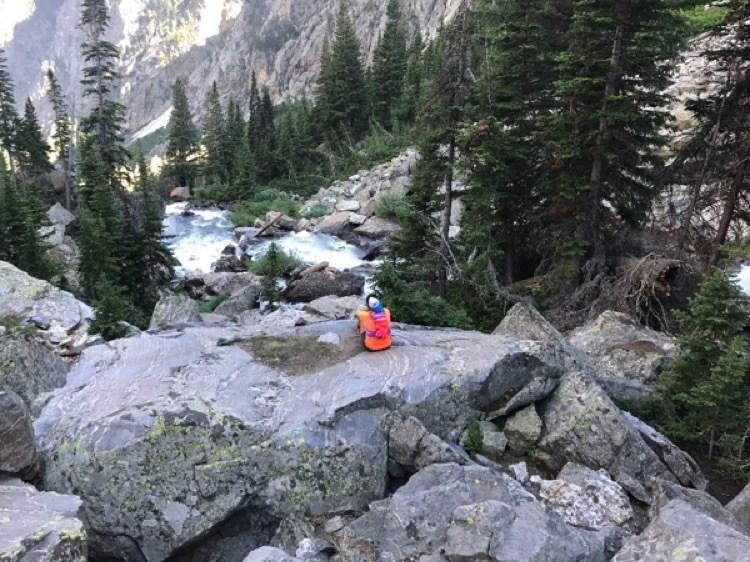 Fortunately, the Tetons have plenty of fresh water sources if you’re spending multiple days out on the trails and need to rely on a filter. We detoured to the local Smith’s in Jackson Hole, Wyoming for a few provisions before I directed Frank towards my favorite spot on earth, the Death Canyon Trailhead. Surprisingly, you can access this trailhead without paying the park entrance fee. If you take the risk, you may be subject to penalties if a ranger catches you. We figured we were fine with our National Park Pass. On our way to the trail, we passed by a pullout area where moose like to hang out. Sometimes the moose like to people watch too and head to the side of the mountain on the right. We saw the most wildlife in the early morning and evening. What wildlife you see in the park will depend on when you visit. We camped at the Death Valley Trailhead for two nights. A lot of through- and multi-day hikers use this trail, so you’ll likely go unnoticed. If you’re looking to backcountry camp, request your permit in advance. You don’t want to be scrambling for lodging after a long day on the trails. On a side note: this is bear country. Be mindful of where you pack food. We stored our snacks in a large Yeti cooler which is certified bear proof. Park Rangers recommend bringing bear spray with you wherever you go. We didn’t have any bear spray, but we did see one grizzly from the trails in the park. It was on a less-trafficked route and we booked it out of there quickly. If you’re venturing out on less-trafficked trails, learn the basics of how to handle yourself in case of a bear encounter. The Tetons are also at a much higher elevation than the Badlands, and much cooler. Our trailhead was at 6,500 feet. Depending on when you visit, it may get very cold at night. Pack layers accordingly. 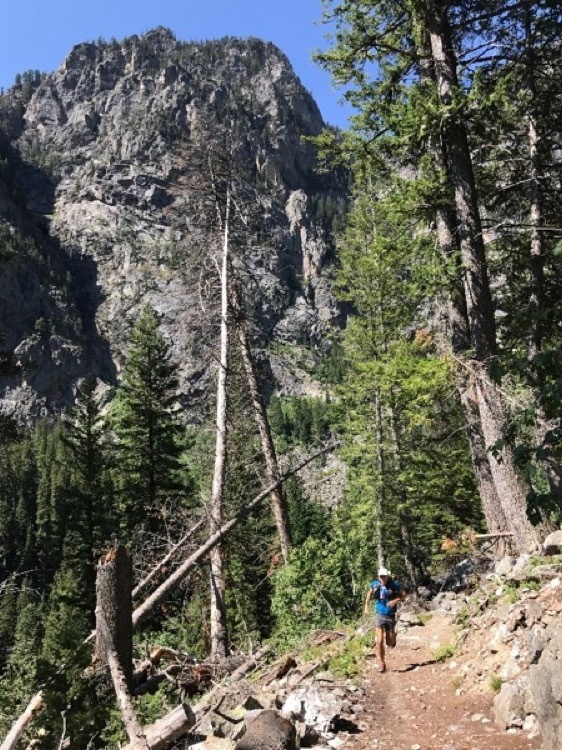 For our first day, we ran a 26-mile out-and-back following the Death Canyon Trail to the Teton Crest Trail. The terrain varies from rocks and roots to soft pine needles to dirt paths. I wore the Solomon Mission 3s and Frank used Pearl Izumi trail shoes. We encountered snow around 9,000 feet and had to scramble a few times since it was covering the trails. Snow is common in the Tetons throughout the summer. I regretted not bringing trekking poles – they would have been nice to keep a firmer footing on the snowy parts. 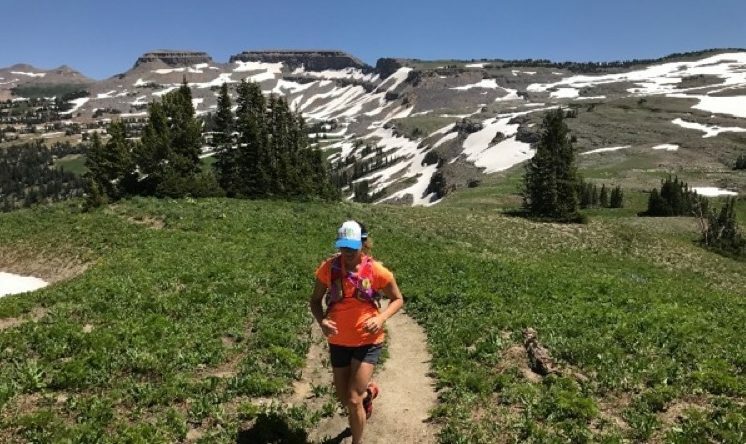 This route passes by a gorgeous waterfall and offers several different trail options if you want to mix up your run. Start early or bring a headlamp if you plan to stay out after dark. Running at higher elevations means it’s easier to get sunburned. I found this out the hard way when two days later my skin blistered, then peeled. So much for looking nice in the photos at my sister’s wedding. I highly advise wearing sunscreen. 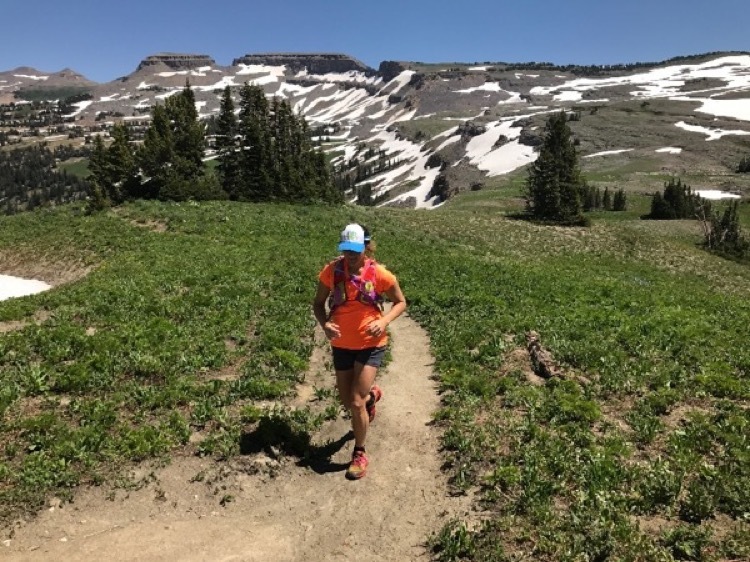 We were so burnt out after our first long run in the park at elevation we decided to run four easy miles on the Taggart Lake Trailhead, several miles north of the Death Canyon Trailhead. We avoided the Jenny Lake area where the Jenny Lake Lodge is located – there were a lot of people there and we smelled pretty awful at this point. On our final night in the Grand Tetons, we camped at the Taggart Lake Trailhead. Thankfully we ended up getting there the night before our run; the trailhead filled up quickly in the morning. Approximately 30 other cars were parked here overnight, though most of them were climbers. You’ll likely fly under the radar if you’re dirt bagging – just don’t make a scene. We stayed in the southern part of the park on this trip and didn’t even scratch the surface of all of the Tetons’ features. The park boasts over 240 miles of trails and eight peaks over 12,000 feet. The terrain varies from easy rollers to grueling switchbacks. There’s something for everyone. For those in search of a reprieve from the dirtbag lifestyle, check out the many lodging options in the park itself. Make reservations early, or you may be searching for a place to stay in Jackson Hole where hotel prices can be through the roof. The park has limited cellphone reception – plan accordingly. We carried park maps in our hydration packs and checked our routes in Jackson Hole before heading into the park. For additional information, check out the National Park Service’s Grand Teton website. This article is misinformed and shallow. She calls the town of Jackson by the name of the region which is Jackson Hole. Then the name of the trail incorrectly as Death Valley trail. What trail are the through hkers doing? Plus I seriously doubt she saw a Grizzly but it makes for a good story. There are many black bears in the Tetons of various colors but few grizzly. Camping at trailheads is prohibited and is deadbeat not dirtbag.